In our strategy development work we help clients be more creative both in their strategic thinking and in how they develop their organisations in order to most effectively compete in today's markets. Our hybrid approach means that we combine the best traditional strategy development techniques with those that encourage innovative and creative thinking and high levels of visual and design sensitivity. We also work with clients to ensure that the organisation's overriding strategic intent is supported by a coherent set of sub-strategies affecting activities throughout the organisation. We assist clients to think creatively about how to generate more new business, how to extend revenues from their existing client base, and how to keep competitors at bay. We work with clients to ensure that (a) they are 'top of mind' - with a compelling offer - for those who are in the market for their products / services, (b) customers and clients keep coming back for more and that they remain loyal, vocal and enthusiastic advocates of the brand, and (c) they stay ahead of and positively differentiated from its competitors. Through consumer insight surveys we help organisations get inside the heads of their consumers. Organisations with the highest levels of client loyalty are likely to be genuinely client centric and really understand - and be geared to anticipating and exceeding - their clients' needs. The best way to gain such understanding is by listening to what your clients have to say. Both as part of our broader strategic assignments, and as standalone projects, we undertake semi-structured qualitative research to gain real insights into the needs and wants of your various stakeholders - your clients and customers, your professional partners, your suppliers and other members of your team. Customer satisfaction is no longer enough. For consumers to come back for more and for them to enthuse about you they need a special connection - an emotional fulfilment - that builds a positive and lasting loyalty. Get it right and they can be 'wowed', enthusiastic and loyal aficionados. Moreover in increasingly commoditised markets the consumer experience may be one of the few remaining ways of achieving and maintaining sustainable differentiation. Our design management work is geared to helping clients optimise and leverage their use of design and their creative assets - from brands and buildings to products and people. This builds on our skills as creatives and management consultants - and on Eric Schneider's specialist skills in managing design. We will also help you to develop strategies, structures, cultures and systems to ensure that your organisation has the best chance of getting the most from its creative assets. Design thinking aims to bring designer processes and ways of thinking to organisations that traditionally may not have seen themselves as being 'creative'. We help clients become more design aware in how they approach everything that they create and help those not trained as 'creatives' to complement their existing skills by also thinking and behaving more like designers. We help organisations to develop a culture of innovation and build their innovation capabilities. A genuinely innovative organisation is one that is always looking to find new ways of adding value in all aspects of what it is doing and how it is doing it. We work with our clients to boost the effective creativity of their teams. Creativity can be key factor for success in today's dynamic, competitive markets. But is not a panacea. Arguably it is only really relevant in a business context if it improves an organisation and its performance. Unchecked and poorly managed, unbridled 'creativity' can also have highly damaging consequences. The management challenge is how to put in place conditions that are most likely to develop and nurture positive creativity and then how to manage it to add value with a degree of risk acceptable to the organisation. 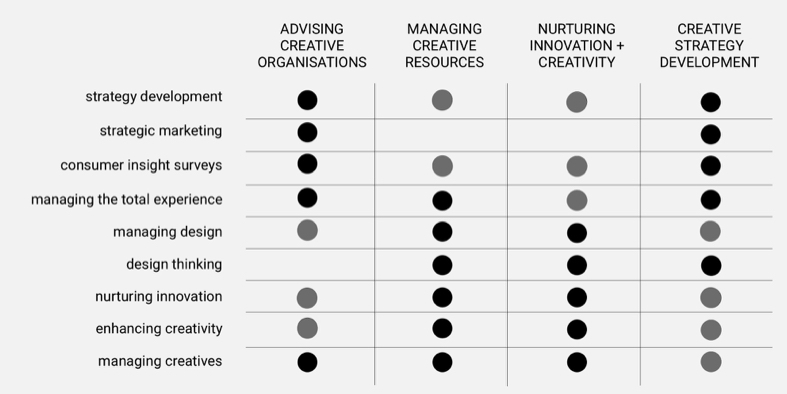 We help organisations get the most from their creative teams. Eric Schneider's background as both a strategist and an architect means that we bring a holistic approach, have a strong empathy with designers, and combine robust thinking with sensitivity when working with creatives. We aim to provide supportive, positively challenging and energising relationships out of which creative leaders and their teams can expect to get a fresh perspective on the key issues facing them and insightful advice as to how best to achieve their objectives.